Before it was even unveiled, we knew we could count on Horacio Pagani to develop one of the most lust-worthy cars to grace our pupils in the form of . And then there’s the fact that it’s a marvel of modern engineering, with the Roaster weighing less than its coupe counterpart thanks to clever engineering. Immaculate design comes standard, as it should for a car costing $2.4 million, but we’re even more happy about the online configurator that has just gone live on Pagani's website. That's because only 100 units are being made and all are spoken for. 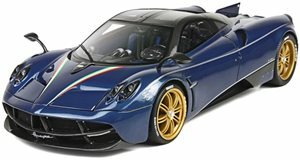 As comprehensive as it is, there is plenty lacking from this configurator because Pagani prides itself on bespoke handcrafted cars, meaning that no color scheme or material is off the books. Simply bring Pagani and idea and a briefcase (or wheelbarrow) full of cash and your wish is his command. Due to this simple fact, we were only able to spec out our dream Huayra Roadster to the extent you see here. Red is a perfect color to express Italian flair and an exposed carbon fiber bottom is a must given Pagani’s expertise with the material. Don’t like our Huayra Roadster? Then go and show us what you come up with.